PRICE $ 775.00 plus Shipping to 48 contiguous STATES $59.00. Presented is another in our premier collection of exceptionally detailed aircraft models that is true to the original in the minutest detail. 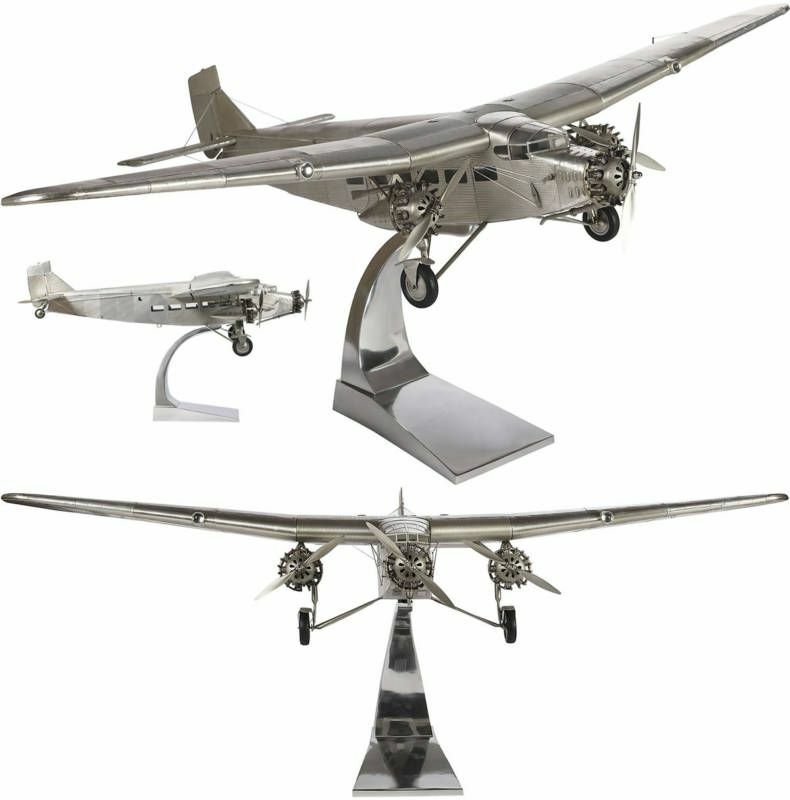 It is for collectors and model airplane buffs, or those seeking an incredibly impressive gift. This is a model so unique it will never be surpassed. This replica is of the most famous of the twelve Boeing Model 314 Clippers, the Dixie Clipper, and America’s first presidential airplane. It is built to a level of excellence unparalleled in production model making. No one, even custom professional model makers, can achieve this level of accuracy at anywhere near this price. Our Ford Tri-Motor is designed and built in the same fashion as the real planes using frame and rib construction. The attention to detail is outstanding with corrugated aluminum skin on the wings, fuselage, and control surfaces, i.e. ailerons, rudder and elevator. 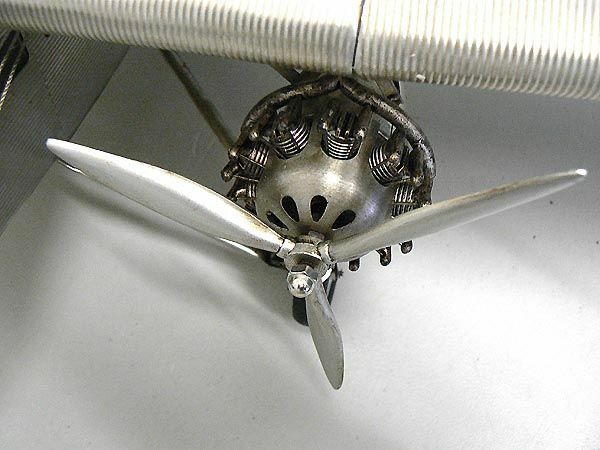 The engine's propellers spin. 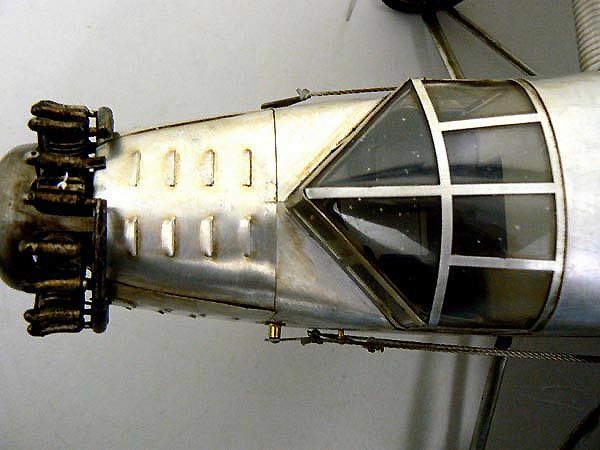 The nacelles are of made of spun aluminum, and the doors and hatches use aluminum sheet, the cockpit and all portholes are accurately replicated. Everything is authentic to the period. DIMENSIONS are 40" wingspan, 26 3/4" long, 6" high. FLAT RATE SHIPPING & PACKING to 48 contiguous States $55.00. HISTORY: The Ford Tri-motor (also variously identified as the "Tri-Motor"), nicknamed "The Tin Goose," was a three engine civil transport aircraft first produced in 1925 by Henry Ford and continued in production until June, 1933. A total of 199 Ford Tri-motors were built between 1926 and 1933, including 79 of the 4-AT variant, and 117 of the 5-AT variant, plus some experimental craft. 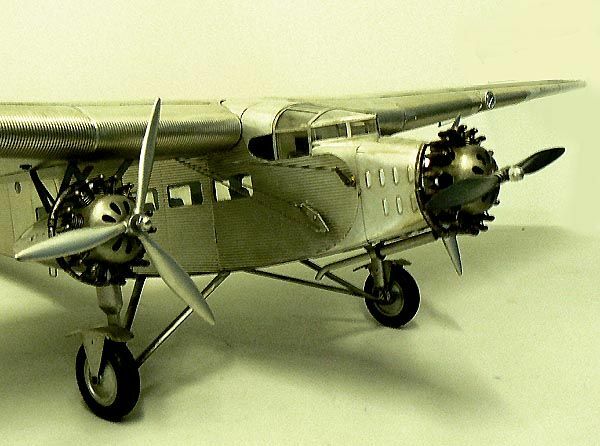 Well over 100 airlines of the world flew the Ford Tri-motor.The impact of the Ford Tri-motor on commercial aviation was immediate, as the design represented a "quantum leap over other airliners." Within a few months of its introduction, Transcontinental Air Transport was created to provide a coast-to-coast operation, capitalizing on the Tri-motor's ability to provide reliable and for the time, comfortable passenger service. While advertised as a transcontinental service, the airline had to rely on rail connections with a deluxe Pullman train that would be based in New York being the first part of the journey. Passengers then rendezvoused with a Tri-motor in Port Columbus, Ohio, that would begin a hop across the continent ending at Waynoka, Oklahoma where another train would take the passengers to Clovis, New Mexico where the final journey would begin, again on a Tri-motor, to end up at the Grand Central Air Terminal in Los Angeles. The grueling trip would only be available for a year before Transcontinental was merged into a combine with Western Air Service. Ford Tri-motors were also used extensively by Pan American Airlines, extending service from North America into Central and South America during the same period. The heyday for Ford's transport was relatively brief, lasting only until 1933 when more modern airliners began to appear. Rather than completely disappearing, the Tri-motors gained an enviable reputation for durability with Ford Ads in 1929 proclaiming, "No Ford plane has yet worn out in service." First being relegated to second and third tier airlines, the Tri-motors continued to fly into the 1960's, with numerous examples being converted into cargo transports to further lengthen their careers and when World War II began, the commercial versions were soon modified for military applications. Some of the significant flights made by the Ford Tri-motor in this period greatly enhanced the reputation of the type for strength and reliability. One example is of Ford 4-AT Tri-motor serial number 10, built in 1927. It flew in the United States and Mexico under registration number C-1077, and for several years in Canada under registration G-CARC. It had many notable accomplishments; it was flown by Charles Lindbergh and Amelia Earhart among many others. It made the first commercial flight from the United States to Mexico City, and the first commercial flight over the Canadian Rockies. After damage on landing in 1936, it was grounded and remained for decades at Carcross, Yukon. In 1956, the wreck was salvaged and preserved, and in the mid 1980s Greg Herrick took over C-1077 and began restoring it. As of 2006, C-1077 is in flying condition again, restored to its December 1927 appearance. Making headlines became a Tri-motor trademark. 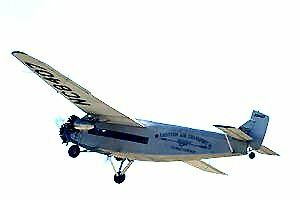 Between 27 November and 28 November 1929, Admiral Richard E. Byrd and his crew made the first flight over the South Pole in a Ford Tri-motor called Floyd Bennett (one of three aircraft on the expedition, the others being The Stars and Stripes and The Virginian), replacing the Fokker Tri-motors Byrd previously used. Franklin Roosevelt also flew aboard a Ford Tri-motor in 1932 during his presidential campaign in one of the first uses of an aircraft in an election, replacing the traditional "whistle stop" train trips. 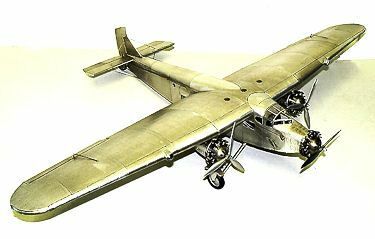 In postwar years, the Ford Tri-motors continued in limited service with small, regional air carriers. One of the most famous was the Scenic Airways Ford Tri-motor N414H which was used for 65 years as a sightseeing aircraft flying over the Grand Canyon. Characteristically, the aircraft is still in use as of 2008, mainly for promotional and film work. OUR UNCONDITIONAL, NO NONSENSE, GUARANTEE: If not completely satisfied with your purchase it may be returned, if without damage, within three days of receipt in its original packaging. Return items must be insured for their full value. A prior email authorization by us for the return is required. Shipping charges are included in this offer and are refundable if due to our error within the continental United States.